Frances Cole is a recently retired GP passionate about quality primary care and community management of persistent pain since in 1996. 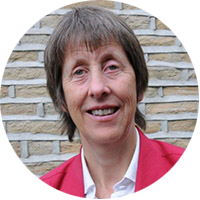 She gained a postgraduate diploma in CBT therapy in 1993-4 and focused on the role of biopsychosocial approach to persistent pain management. In 1996 she and colleagues set up the first primary care based pain management programmes in the UK with £2,000 grant, taking only referrals from GPs! Patient outcomes were crucial to see whether CBT based pain management programme approaches made a difference. The outcomes found people with pain had significantly less anxiety, depression, improved physical health and, most of all, their confidence to cope with their lives despite the pain had doubled. They grew their lives, slept better, some returned to work, travelled to see family abroad and took up new hobbies and friendships. Since then Frances has worked in pain rehabilitation and enabled many patient resources develop from collaboration with patients and clinicians both in primary and specialist care in the UK. Frances was Clinical Leader for Chronic Pain NHS Kirklees 2009-2012. Frances was Chair of British Pain Society Pain Management Programme Special Interest Group 2010-2012 and somehow picked up a National NHS Clinical Leadership Award in 2011 for pain work!